Managing your fleet is a difficult task. We understand the frustrations with paper logs, inspection reports, payroll, driver tracking, asset management and all the accompanied tedious work. Now optimizing your fleet is as easy as a click-of-a-button. Mobile Warrior automatically captures and reports driver data, including Hours of Service (HOS), inspections, expenses, loads and more. When it comes to improving your fleet’s performance, it’s never been easier and more affordable. From smartphones and tablets to your screen, Mobile Warrior puts you in control. Customize driver payroll reports by miles, hours, shifts, etc. 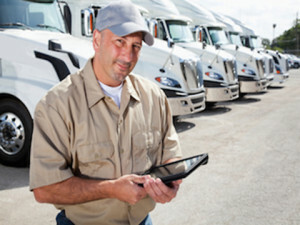 See how Mobile Warrior can benefit with the right fleet software solution.